My new favorite pan for baking eggs (thanks to a suggestion by reader Angie). 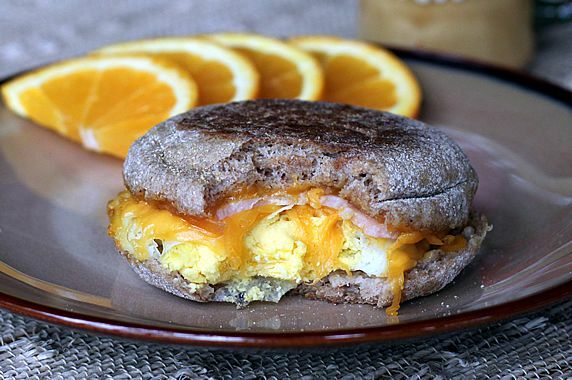 It makes the eggs the perfect size to fill English Muffins to the edge. This non-stick pan also works well for baking eggs, along with super-sized muffins and cupcakes. 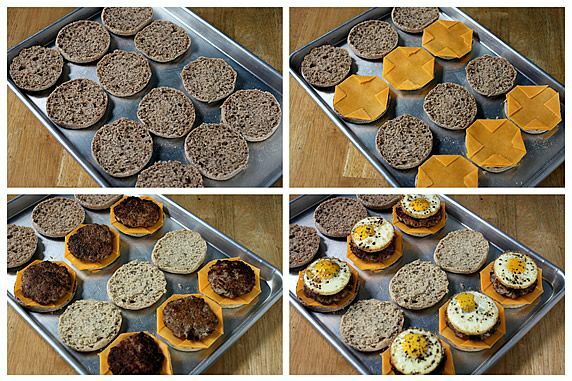 I use these when I just want to cook 1 or 2 eggs for McMuffins. They're non-stick and the perfect size. These handy sheets are the perfect size for wrapping individual sandwiches for the freezer or microwave. 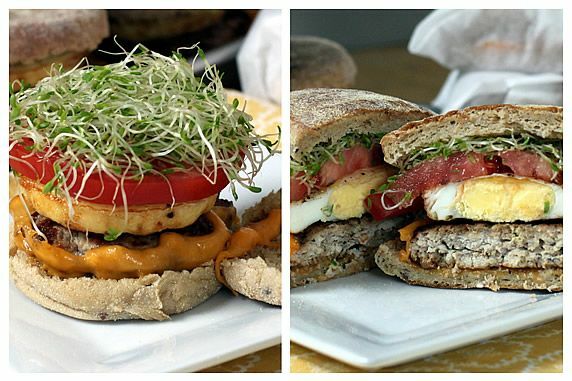 These popular breakfast sandwiches get a healthy makeover with the added convenience of making a big batch and freezing them for a quick, grab-and-go breakfast. ASSEMBLE MUFFINS. 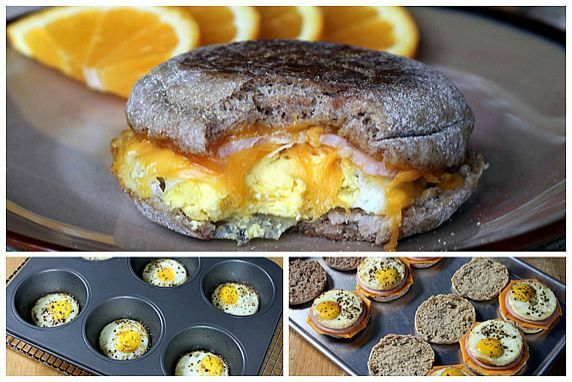 Split open muffins; on each one, stack a slice of cheese, a Canadian bacon slice or sausage patty, and a baked egg. WRAP & FREEZE MUFFINS. For microwave reheating, wrap each muffin in parchment or wax paper. 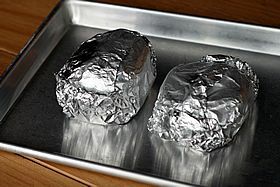 For oven reheating, wrap each muffin in aluminum foil. Place wrapped muffins in plastic freezer bag and freeze. REHEAT IN MICROWAVE. If thawed, 40-60 seconds at full power. If frozen, 3 minutes at half power, turning over after each minute. REHEAT IN OVEN. In 350 degree oven, place on baking sheet and heat for 15 to 20 minutes if thawed; 30-40 minutes if frozen. One of my guilty pleasures is an occasional Egg McMuffin at McDonalds. I always wished they served breakfast all day, because that's the only thing on their menu that I like. Mickey D's makes them with either Canadian bacon or sausage. I like them both ways. However, like many fast foods, if you ever look at the calories, fat, and sodium in these it becomes even more of a GUILTY pleasure to eat one. 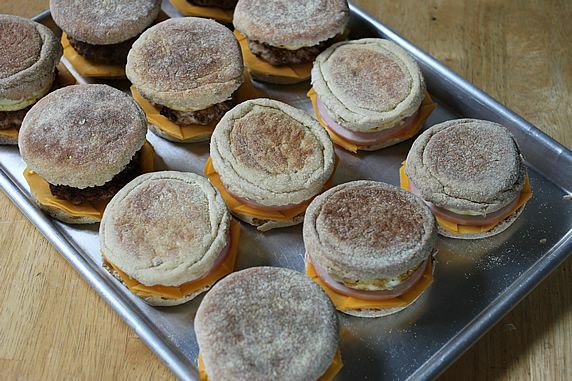 It's not a new idea to make one of these breakfast sandwiches at home, but I decided to figure out a tasty homemade alternative that I could mass produce, freeze, and have available for a quick grab-and-go breakfast. I followed similar procedures used by Nick at Macheesmo.com. Love the make-ahead convenience of these. 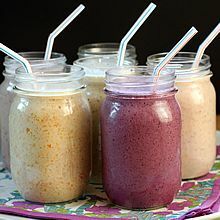 I'm so much more likely to eat healthy food in the morning if it's made and ready to eat--like my make-ahead Refrigerator Oatmeal and Oatmeal Smoothies. 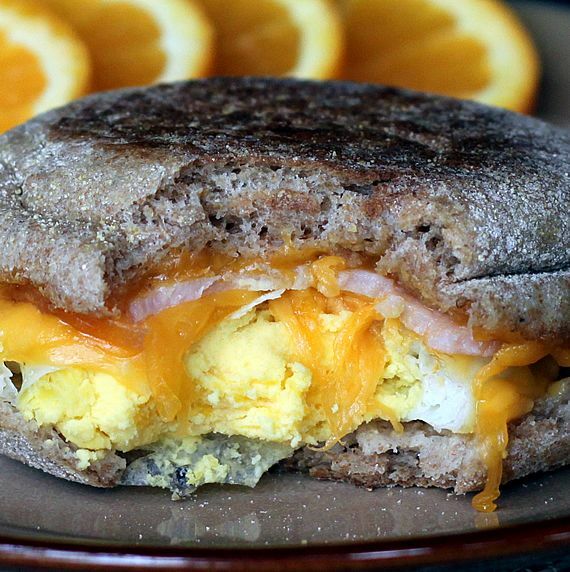 Turns out that these Egg McMuffin copycats are incredibly fast and easy to make, and they amount to a pretty healthy, protein-packed breakfast. I made up one batch of these with Canadian bacon (already a lean meat choice), and a second batch using my Homemade Turkey Breakfast Sausage. There's a dramatic difference in calorie, fat, and sodium content between McDonalds and my homemade McMuffins, especially the sausage version. Here are the numbers. sliced cheese -- I used regular cheddar cheese that comes in ultra-thin slices, only 45 calories per slice; you can also use reduced-fat cheese, but it doesn't melt as well. McDonalds uses American cheese, if you're looking for a more authentic taste. 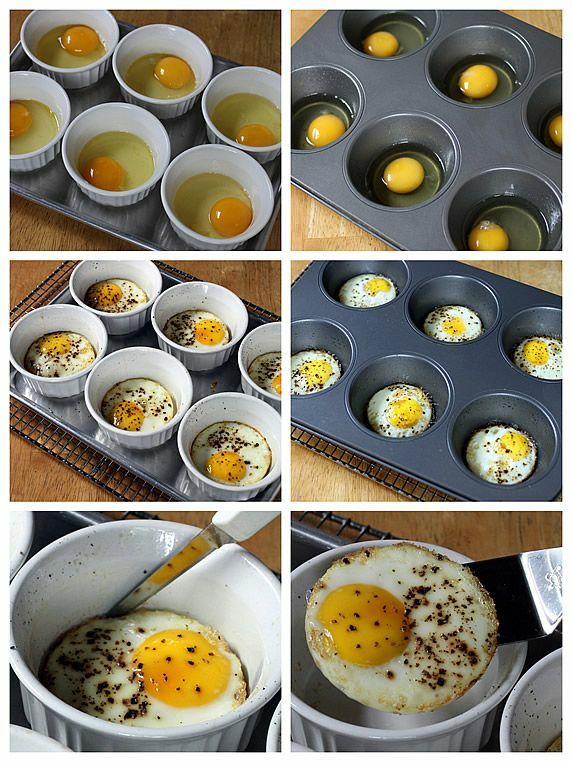 I recommend using either jumbo muffin tins or ramekins for baking multiple eggs at one time. 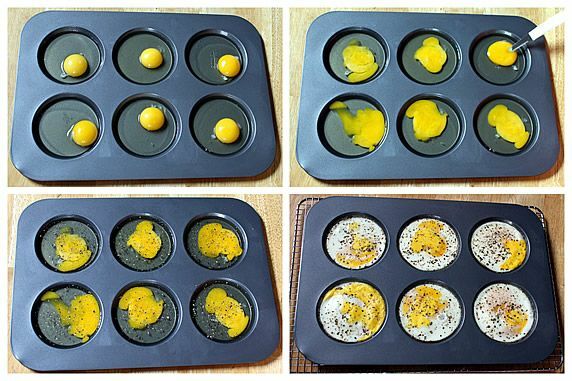 I'd seen the idea for using muffin tins for baking eggs from several sources on Pinterest. Great idea! However, I found that regular muffin tins are too small for shaping the eggs to fit the English muffins. Jumbo muffin tins worked better. 7-oz. ramekins worked the best; they're closest to diameter of English muffins. Both are available on Amazon. Step 2. 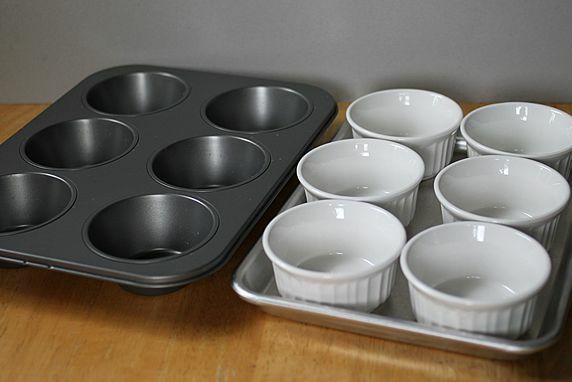 Spray the ramekins or jumbo muffin tins with cooking spray and add an egg to each one. (Or, add the equivalent amount of Egg Beaters or egg whites.) 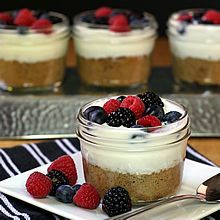 If using ramekins, put them on a baking sheet to make it easier to get them in and out of the oven. Step 3. Add freshly ground black pepper to your liking. I like a lot of pepper, can you tell??? I don't think additional salt is necessary, since the cheese and meats are already salted. 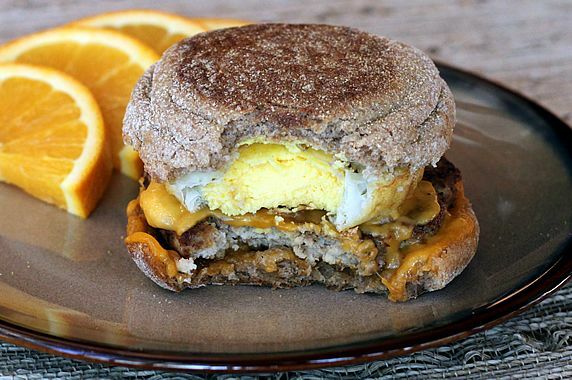 This helps lower the sodium amount in these healthier McMuffins. Step 4. Bake eggs at 350 degrees for 25-30 minutes, until set. Although I normally like my egg yolks a little runny, I cooked these completely since I'd be freezing them. That's the way McDonald's makes them, too. The baked eggs are easy to lift out with a small spatula. If they're stuck around the edges, loosen them gently with a thin knife. 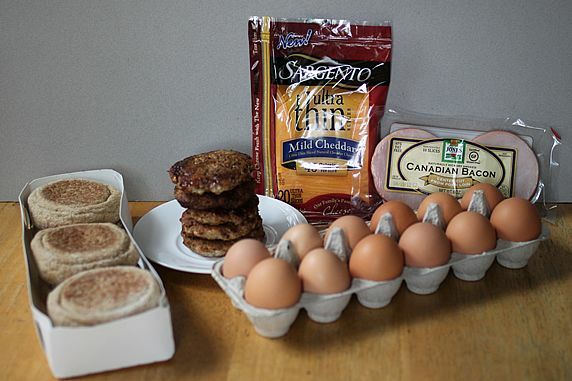 After first posting this, two readers made great suggestions for baking the eggs. I tried both suggestions and loved them. They're pictured below. Beth wrote that she used to work at McDonalds. Before they cook the eggs for McMuffins, they use a spatula to break the egg yolk so it flattens and spreads some in the egg white--better eatin' that way! I used the tip of a small knife to break my yolks. I'm using this great idea regularly now. Thanks, Beth! Step 6. Add the baked eggs when they're ready. I made half of mine with turkey sausage patties. Wrap for microwave reheating. 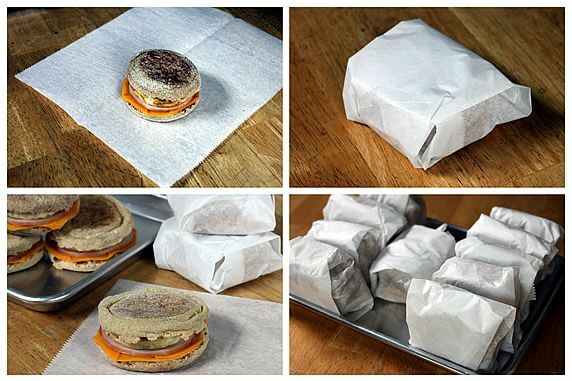 I wrap my individual McMuffins in dry wax paper deli sheets. That way, I can put the wrapped sandwiches directly in the microwave for reheating. (You can also use pieces of wax or parchment paper.) 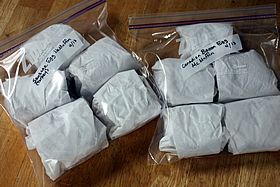 After they're all wrapped, put them in freezer ziploc bags and freeze them. It takes under a minute to reheat a thawed McMuffin at full power in the microwave. A frozen one takes about 3 minutes at half power (turn it over after each minute). Wrap for oven reheating. Wrap them in aluminum foil if you prefer to reheat them in the oven. This is a good option if you want to reheat several at one time. It takes approx. 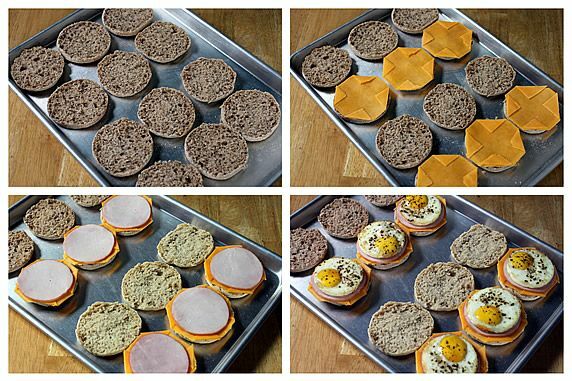 30-40 minutes to reheat frozen McMuffins in a 350 degree oven. If they're thawed, it only takes about 15-20 minutes. The outside of the muffin gets crispy when these are warmed in the oven. Feeding a crowd? Make up a bunch of these in advance, wrap them individually in foil, and reheat them all at once in the oven. They're easier to manage if you arrange them on large baking sheets for putting in and out of the oven. You'll need to increase the baking time a bit if you're reheating larger quantities. I've found the waxed paper deli sheets and individual aluminum foil sheets at Sam's and Costco. They're also available on Amazon. I love the convenience of grabbing one of these from my freezer and microwaving it in the paper wrapper. It's a great breakfast on-the-go. Or, take it with you and reheat it a work. 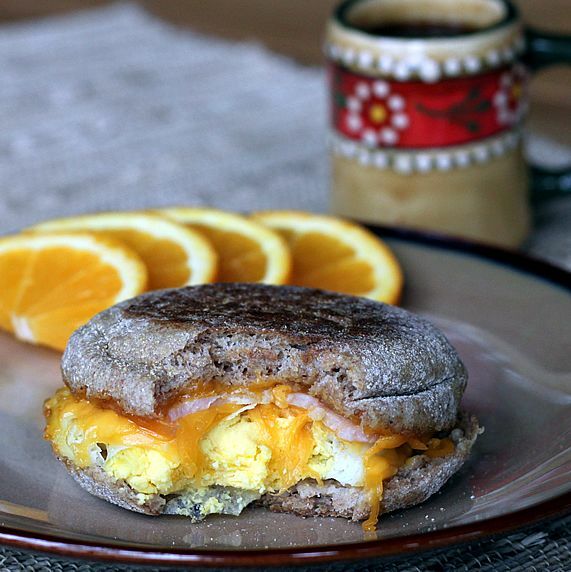 Here's my healthier McMuffin with Canadian bacon. It tastes as good as Mickey D's, and I don't have to feel guilty about eating it. Here's the healthy sausage version. It's yummy, too! Make it even healthier! After reheating your sandwich, you can take the top off and add a variety of toppings that suit you. This sausage McMuffin has sprouts and tomato added. I like them with avocado and salsa, too. There are lots of possibilities. And, they don't have to be for breakfast; these are good for any meal. 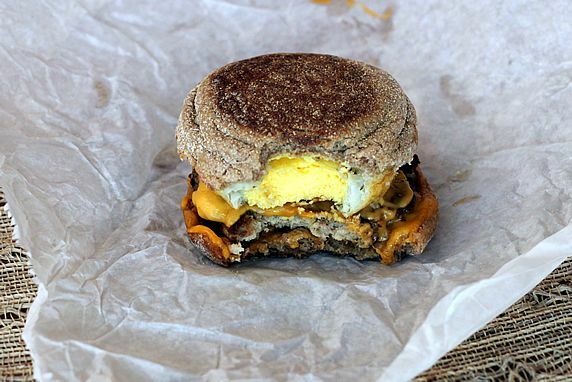 One bite and I was sold on these healthy McMuffin copycats. I love having an easy, ready-to-eat breakfast on hand.